When my dad retired, almost 30 years ago, he had a Manhattan at 4:00 pm every day, “for medicinal purposes only”, of course. It must have some longevity properties, because Dad is 91! This recipe, Dad’s Manhattan, is his version of a very classic drink. The Manhattan is a drink with a long history. The details seem vague as to who originated the drink, but the one thing that remains the same is it was developed in NYC’s Manhattan borough in the mid 19th century. It’s made with whiskey, originally rye, but bourbon, blended and Tennessee whiskeys are also used. A regular Manhattan is made with whiskey, sweet vermouth, a dash or two of bitters and garnished with a Maraschino cherry. A Perfect Manhattan is made with whiskey, even amounts of both sweet and dry vermouth, a dash or two of bitters and is garnished with a twist of lemon. Dad’s Manhattan is made with bourbon, preferably Jim Beam Kentucky Straight Bourbon, and dry vermouth. That’s it, no bitters, definitely no sweet vermouth, and certainly no cherry or lemon to distract the taste buds from the bourbon and vermouth. My preference is Michter’s Kentucky Straight Rye Whiskey, which I keep in this lovely decanter. Whenever he would order a Manhattan in a restaurant, he would say “a dry Manhattan, straight up, no fruit.” There were many times when the wrong cocktail arrived. By saying “dry” Dad was indicating dry vermouth in lieu of sweet. However, we knew immediately when the bartender had used sweet vermouth, the cocktail was too dark, and he sent it back. Same thing if they added fruit, it was returned, and if they just took the fruit out and re-served it, he knew that, too! Because of the vermouth, this cocktail is placed in the Martini category, and is usually served in a Martini glass. Over the years, however, my father has tried many different glasses. This one is his favorite and mine, too. I have had many Manhattans over years to accompany my Dad in his ritual. It’s a powerful drink and one is my limit. If you’d like a little nosh to accompany your cocktail, try our Curried Deviled Eggs. Dad’s Manhattan is made with bourbon, preferably Jim Beam Kentucky Straight Bourbon, and dry vermouth. That’s it, no bitters, definitely no sweet vermouth, and certainly no cherry or lemon to distract the taste buds from the bourbon and vermouth. My whiskey preference is Michter’s Kentucky Straight Rye Whiskey, which I keep in this lovely decanter. Place 4 ice cubes in a cocktail mixer, add the bourbon and vermouth, and stir until the shaker frosts up, about 25 swirls. Place the cover over the shaker and pour. Zarzamora Ardiente means “fiery blackberry.” This cocktail contains blackberries and jalapeño, a little fresh lime juice, agave, and 2 ounces mezcal. It’s sweet/tart with some heat and a delightful smokiness from the mezcal. I’ve never been a fan of mixed drinks, they tend to be very sweet. But it seems that in this new age of creativity on the part of bartenders, natural flavors and juices and less sugar are in style and the result is delicious and interesting cocktails. I’ve had two mezcal cocktails that I’ve really loved. A local Mexican restaurant in Wilton CT, Cactus Rose has a Smoky Cosmo, made with Espadin mexcal (sic), orange liquor, blood orange puree, and fresh lime juice that is delightful. My very first mezcal cocktail was in LA at Broken Spanish, made of EL ZOCALO mezcal, passion fruit, Campari, yellow chartreuse habanero tincture, and Sal De Gusano (which is agave worm salt – see blow for more information). I was blown away and definitely hooked on this very special distilled beverage made from the agave plant. Tequila and mezcal are both made from agave, a succulent that thrives in hot, arid environments and requires very little water to survive. Tequila is made from only one type of agave, blue or weber, and must be grown in the state of Jalisco or in small parts of four other states. Mezcal (tradition spelling is mescal) is made from 28 or more varieties of agave from all over Mexico. Mezcal has a smokiness that, in my opinion is its real appeal, missing in tequila. There are two types of mezcal: one made from 100% agave and a second made from a minimum 80% agave and a maximum of 20% other sugars. Mezcal has three different aging categories: abacado, joven, or blanco is clear, un-aged, and bottled immediately; it may have flavoring or coloring added. Resposado or madurado is aged in wood barrels for 2-11 months, and añejo is aged in wood barrels for a minimum of 12 months. The smoke flavor is the result of the processing. Once the plant is harvested, the leaves are removed with a machete revealing the heart of the agave, called the piña, which is taken to a palenque, a rustic distillery. The agave is then processed further, layered over the hot oven and covered with the outer leaves of the plant and roasted for several days. The caramelized agave is then crushed or pulverized, fermented, distilled and sometimes aged. If you want to learn more about this excellent liquor, I suggest Finding Mezcal: A journey into the liquid soul of Mexico with 4o cocktails, by Ron Cooper. My daughter and her boyfriend gave me a copy for Christmas and it’s a fun read! I remember hearing that tequila had a worm in the bottle when I was younger (YUK)! This is apparently a marketing gimmick. What is in the bottle is either the larvae of a caterpillar of a night butterfly or the agave snout weevil that naturally infest agave plants and the worm salt (Sal De Gusano) mentioned in the above cocktail from Broken Spanish. I’m trying a new mezcal today, Sombra mezcal artesanal made from 100% Maguey Espadin using the joven aging method. The resulting cocktail has a deep purple color and depending on how much you muddle the jalapeño, it can have quite a kick. I like it over ice garnished with a thin slice of jalapeno. Place 2 slices jalapeño in a cocktail shaker and crush with a muddler or the handle of a thick wooden spoon. The more you crush the jalapeño more heat is released from the essential oils of the chili. Add 6 blueberries and crush with the muddler. Add mezcal, lime juice, agave, and a handful of ice cubes. Cover and shake well. 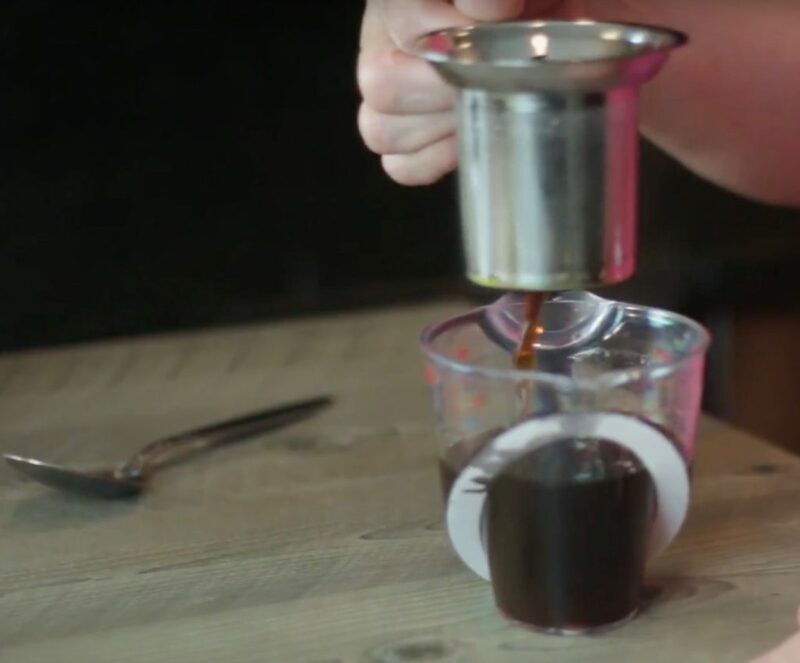 Replace the cover with the strainer and pour into a rocks glass filled with 4 or 5 ice cubes. Top with a slice of jalapeño. We’ve had some hot, sweltering days this summer – high temps accompanied with high humidity. A tall, ice-cold glass of Old-Fashioned Homemade Lemonade is always a welcome treat, especially on days like these. This recipe is based on my memory of how Mom made lemonade when I was a kid. I remember her using both freshly-squeezed lemon and orange juice. While I like my lemonade tart with just a hint of sweetness, the small addition of orange juice calms the absolute tartness of the lemons just enough to make this summer refresher delicious and thirst quenching. Use simple syrup to make the lemonade – no worries about sugar residue on the bottom of the glass. Make up batches and keep in the refrigerator to have on hand to sweeten all your summer drinks – iced tea, iced coffee, and lemonade. Quick and easy to make, old-fashioned homemade lemonade is a refreshing pick-me-up on those tropical summer days. Combine the juices and simple syrup. Add ice and cold water, stir to blend. Serve over ice in a tall glass. Simple syrup is equal parts sugar and water melted over high heat. Make a batch and keep on hand to sweeten iced tea, lemonade, iced coffee or any specialty cocktail. It’s also a key component to making a sorbet or granita. Simple syrups have a decent shelf life. Keep refrigerated in a sealed container for a several weeks. If mold forms on an older syrup, just like jams and jellies; discard immediately. A rich simple syrup is double the amount of sugar to water (a ratio of 2:1). The increased amount of sugar increases the preservation and this syrup lasts up to six months refrigerated in a sealed container. Use a small syrup container, similar to what you see in a diner, and keep it on a small plate to prevent any drips from forming on your table or refrigerator. Here’s a nice selection from Amazon. Simple syrup is quick and easy to make and has multiple uses, like iced drinks, cocktails, sorbets and granitas. Combine the sugar and water in a small saucepan and bring to a boil. Once the sugar is dissolved, set aside to cool. Pour into a covered container and refrigerate. Syrup lasts several weeks and rich simple syrup up to 6 months. Discard if any mold appears on the surface of the simple syrup. I’m not a big flavored coffee drink lover. But, I have to admit that anything “mocha” is very appealing as chocolate and coffee are such delicious companions. 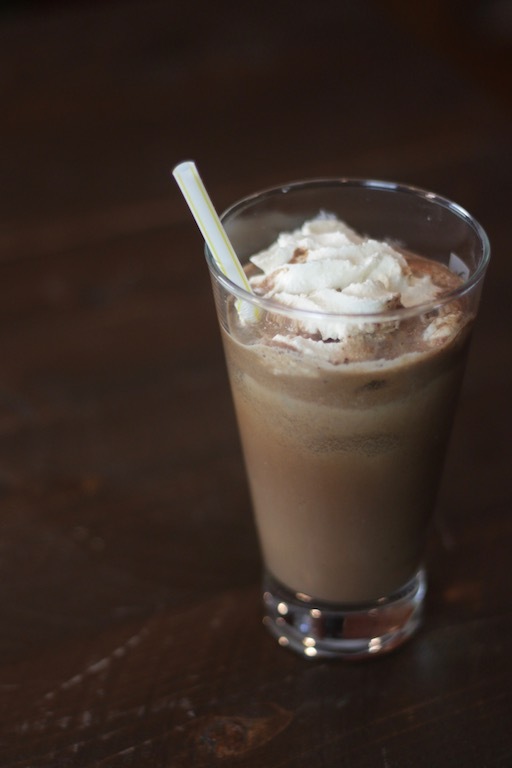 When we were making the video for Mocha Espresso, it seemed logical to also make an iced version, too. Mocha espresso is simply, chocolate milk and espresso! 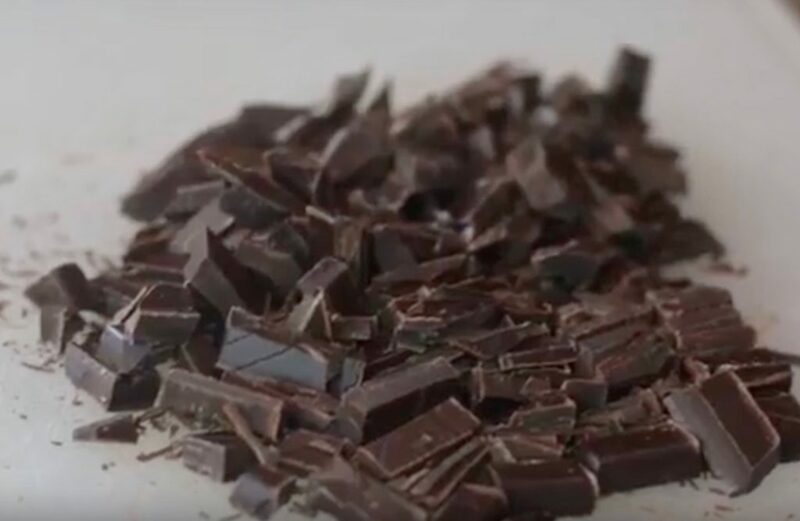 What makes it super delicious, however, is melting very good, dark chocolate in hot milk until very smooth and then combining it with espresso. Hot or cold it’s a decadent treat! Want to make an adult version? Add a shot of coffee liqueur! Enjoy either hot or cold with a slice of Pumpkin Chocolate Coffee Cake! Watch the Mocha Espresso video here and the iced version here. This Iced Tea Concentrate whips up a 1/2 gallon of iced tea in minutes. Make a few batches and refrigerate the concentrate in a Mason jar or other lidded container and use by the cupful to make a ½ gallon batch at a time. This method is great for unexpected company or large parties. The iced tea concentrate doesn’t take much room in the refrigerator and making additional pitchers takes seconds. Place 1/4 cup loose tea or 4 tea bags in a one-cup measuring jar and pour boiling water to cover. Steep for 4 minutes. Fill a pitcher 1/3 full of ice, pour the tea concentrate over the ice, and fill with cold water. Optional garnish: lemon slices. There are so many teas to choose from, you’ll never run out of different flavors to experiment with. Also, you can use decaffeinated regular and herbal tea varieties. Serve simple syrup on the side to allow guests to sweeten, or not, to their taste. Lemon slices or muddled mint can be added for additional flavor. 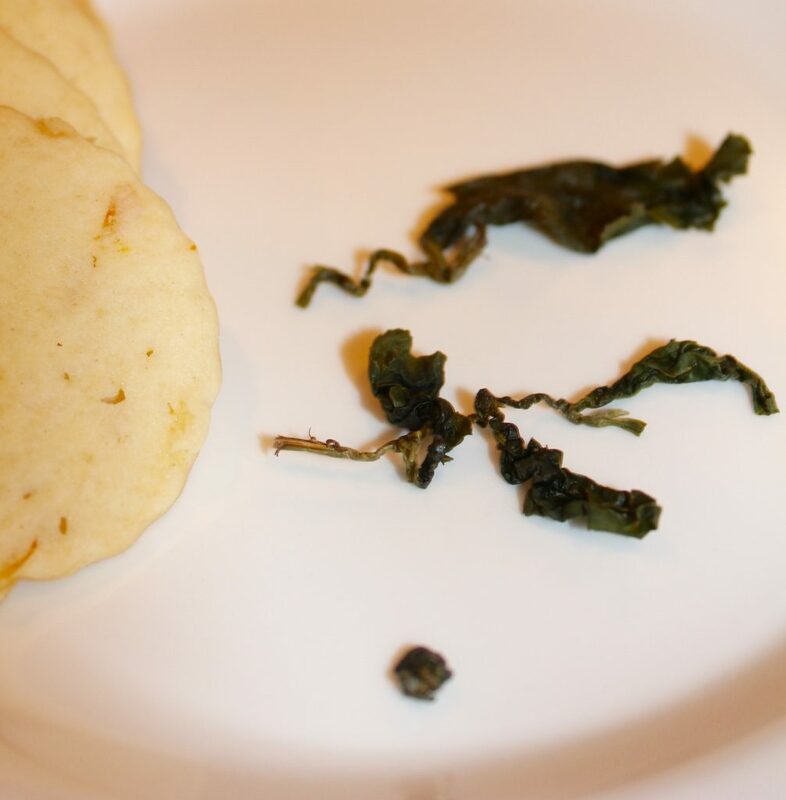 Be sure to check our our informative tea tasting blogs – green tea and black tea. Watch the Iced Tea Concentrate video here. 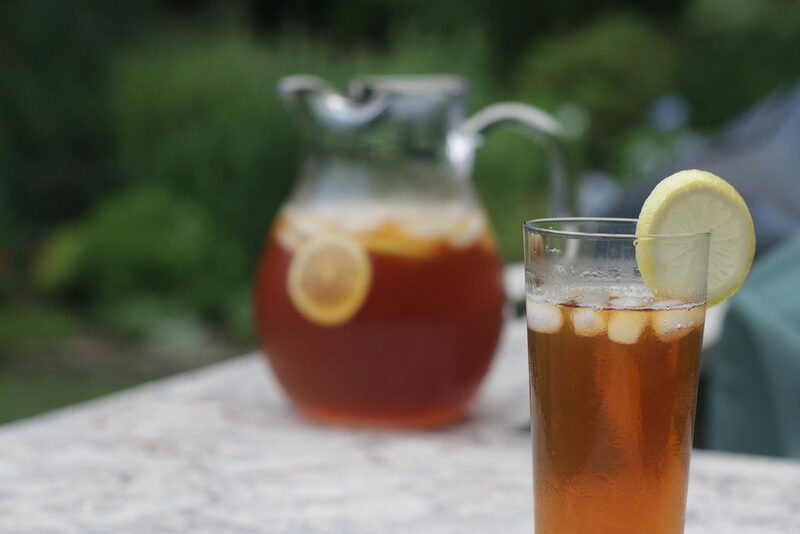 Whip up iced tea concentrate in minutes, and make in batches for quick refills. Serve lemon slices and simple syrup on the side. Place the tea or tea bags in a 2-cup liquid measuring cup. Pour 1 cup boiling water over and let steep 4 minutes. Strain in a ½ gallon pitcher filled with ice. Press down with the back of a tablespoon to extract all the tea. Add cold water to fill. Serve with simple syrup on the side to allow each guest sweeten to their taste. simple syrup: place a cup or two of sugar in a small sauce with 1/2 cup cold water. Bring to a boil and cook until the sugar is completely dissolved. Cool and store in a covered container in the refrigerator. Lasts several weeks. Will Wertheim, the son of my dear friends Carol and Les, took an unexpected path when he branched out into the study of tea after finishing college majoring in environmental science. 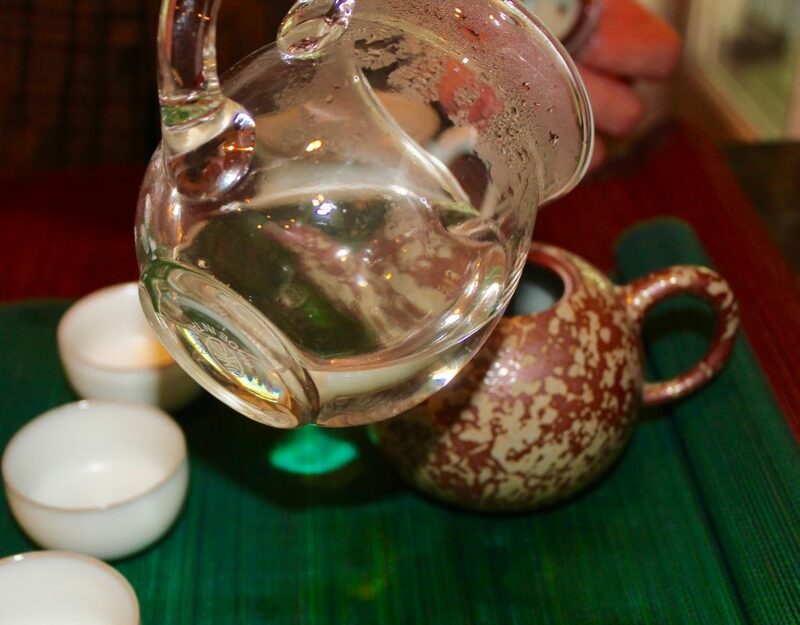 Will began studying with tea master Michael Wong of China Town in 2010. He went on to work at Chelsea Market & Tea, helped open the Harney & Son’s New York store, and was a wholesale rep for Ito En, a Japanese tea company. Will decided to go into the tea business and created an online site to sell fine teas Therein the founding of, Goldsmith Teas, named after his maternal grandparents. Will now lives in Brooklyn and travels the world in search of excellent teas. Here’s a primer on properly brewing tea. Temperature is important to a well-brewed cup of tea. Bring the water to a boil, pour a cupful and let the water cool slightly to 208ºF for black teas, slightly more, 195ºF, for oolong teas and 175ºF for green teas, before infusing. 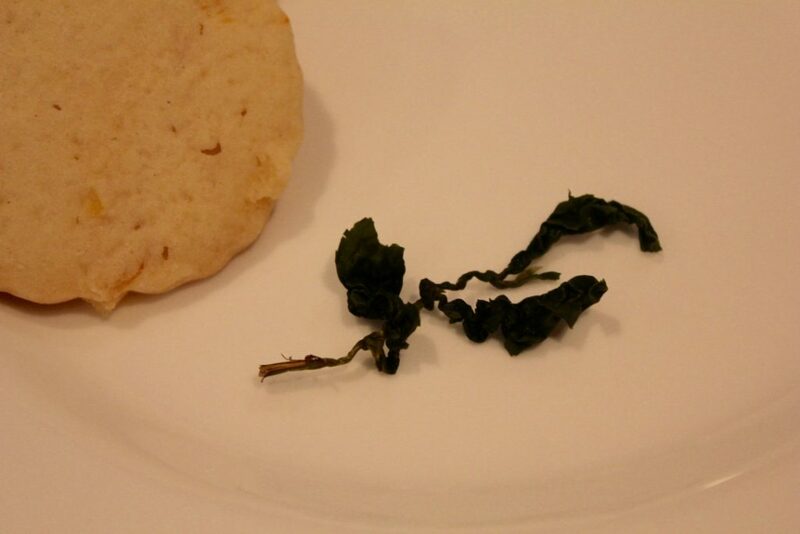 Will suggests using an unbleached tea filter for brewing, such as these sold by arborteas.com. Measure the tea, fill the tea filter and steep, also known as the “agony of the leaf,” for 30 to 60 seconds for most green teas; a longer brew adds caffeine, not flavor. Steep black teas for three to five minutes; longer brewing only increases unpleasant tannins. Will recommends reinfusing the same tea filter two or three times. Though the tea may not be as strong, good flavor remains. Brew the teas as instructed above doubling the amount of tea to two ounces for every eight ounces of water and then pour over ice. Use one heaping teaspoon for every eight ounces of cold water and let sit eight hours. 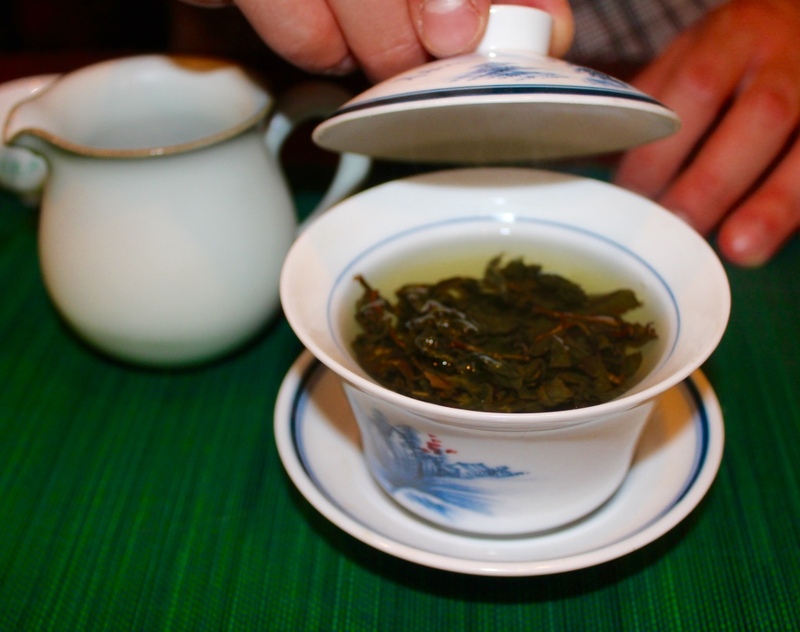 Oolong teas originated in China and are also grown in Taiwan. 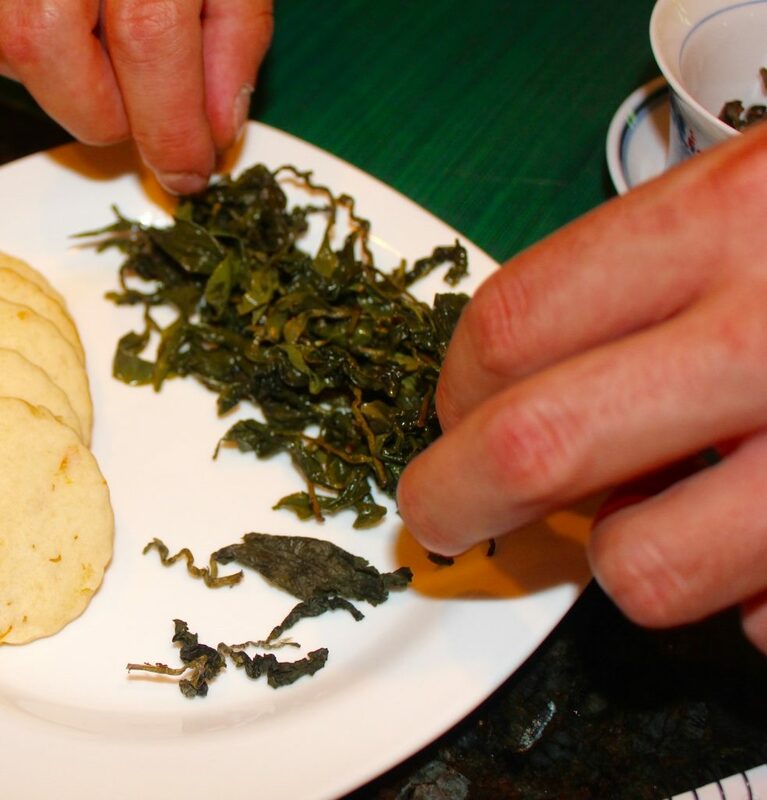 Will purchased this batch of tea leaves while on tour directly from the Taiwanese farmer! Once the tea is harvested it’s left one day to wither, but not dry. The leaves must retain moisture as each leaf is raveled and unraveled up to 30 times. Notice how finely the leaves are raveled and rolled into these small balls. Each infusion, continues to unfurl the leaves. 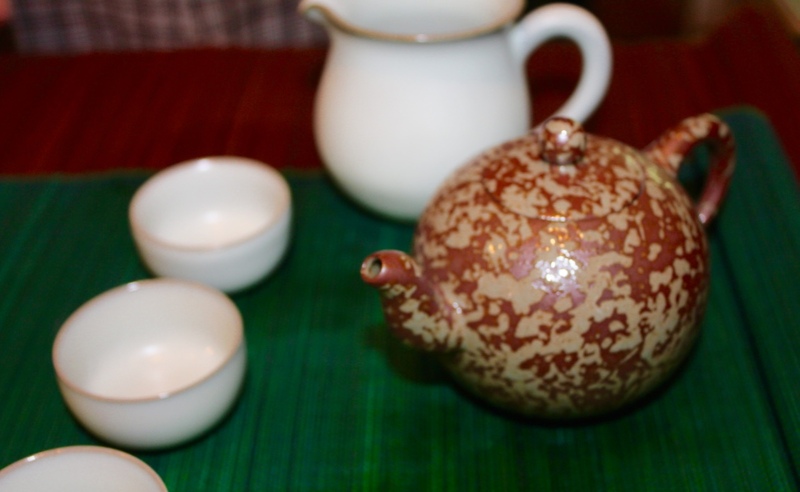 Will used a Yixing Pottery teapot to brew the Jade Oolong, which contributes flavor to the tea. He placed the tea leaves in the pot, poured hot water into the pitcher and let it sit for to cool slightly before adding to the pot and let it brew for 30 seconds. The first thing I noticed was an aroma I didn’t immediately recognize. After a couple of sips and a few more sniffs, I finally identified a clove-like flavor with a slight tongue numbing effect. The tea is grown at the top of mountains with lots of cloud coverage and lack of sunshine and the struggle for sunshine produces more chlorophyll and polyphenols resulting in the numbing sensation. 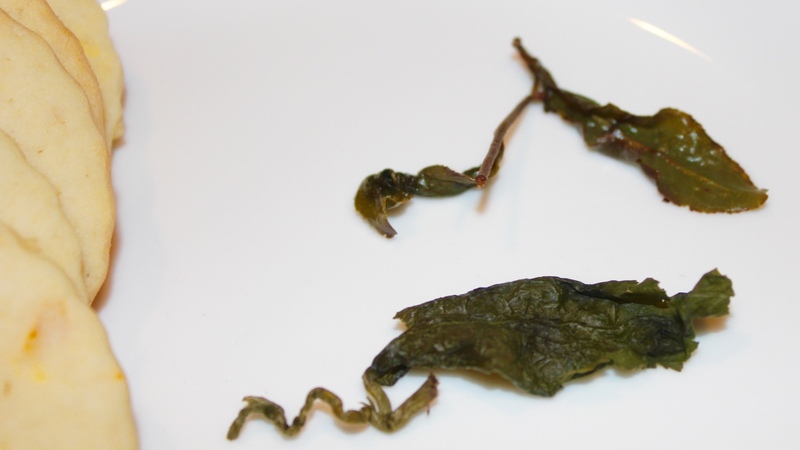 This is the tealeaf after the first steeping; the leaf is unrolled, but still raveled. Will opened the leaf for viewing (those are Mom Carol’s scrumptious orange butter cookies in the corner). The Jade Oolong was brewed four separate times, the clove aroma faded quickly, but the numbing quality was still apparent. The fourth and final brew was tannic, something that doesn’t appeal to me, but look at how the tealeaves have completely opened. 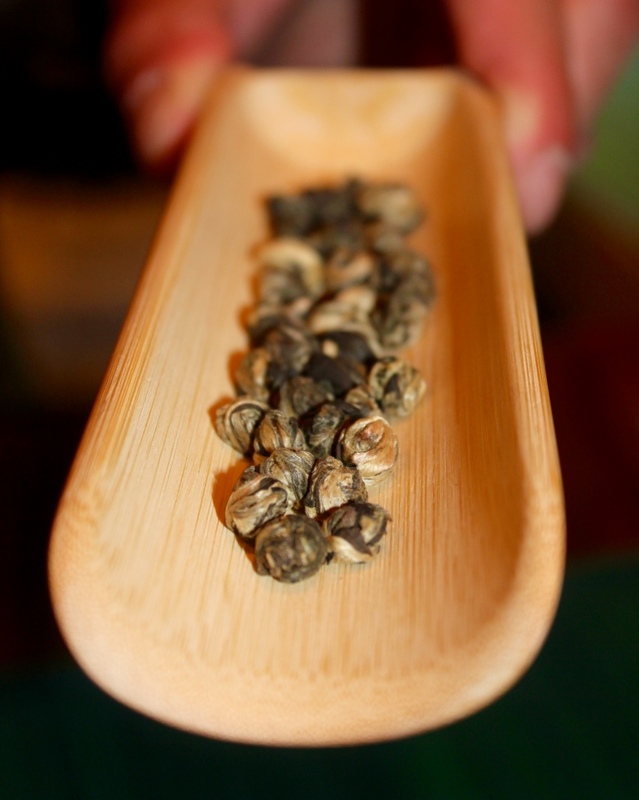 Jade Oolong speeds up your metabolism and creates a “tea drunk” affecting both the mind and the body. Drink enough and you reach a meditative state of awareness and tranquility. Too much, however, can upset the stomach. A little nosh with the Jade Oolong is recommended. Those cookies did the trick! 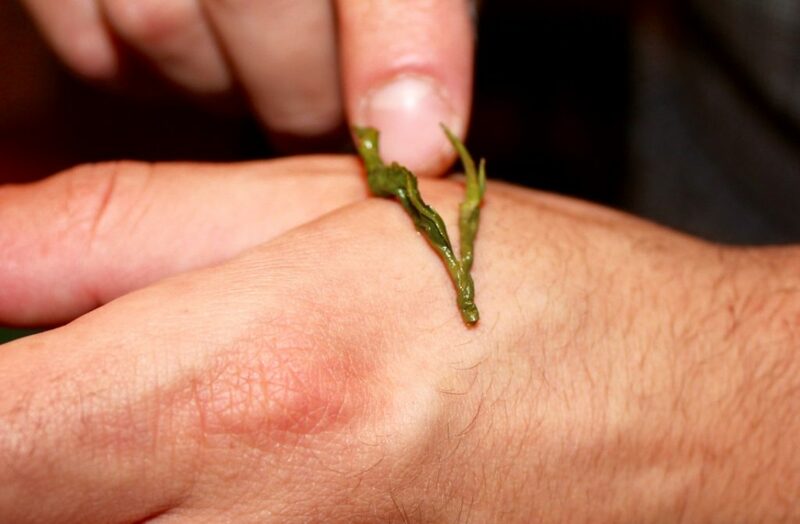 This green tea is briefly fired, which “singes” the edges of the leaf but doesn’t completely dry the tea. The firing creates the Maillard Reaction, a reaction caused by the heating process and the reaction of the sugar and amino acids in the leaves. The easiest way to describe this reaction is to think of the color and flavor created when you toast bread. 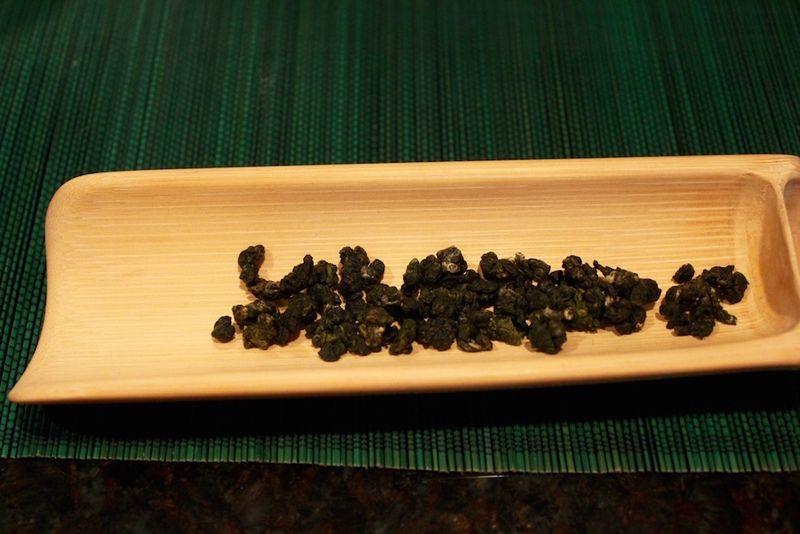 The firing process gives the tea an earthier taste than the Jade Oolong (same tea leaves, just a different treatment). This tea also creates a numbness of the tongue due to the same growing conditions. 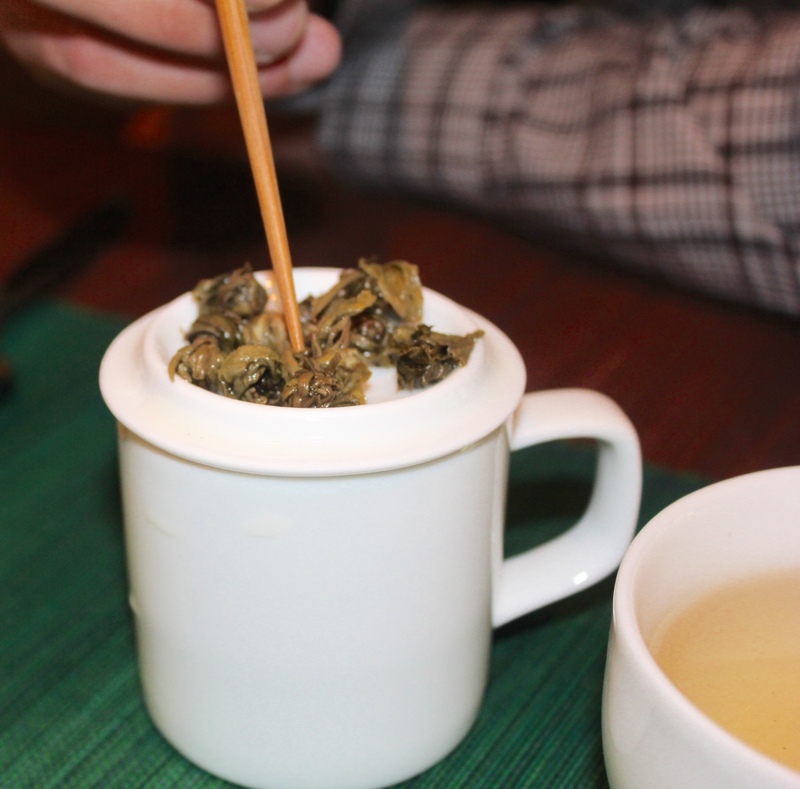 Will uses a Gaiwan pot to make the Amber Oolong. After a couple of infusions, there was an interesting caramel flavor, brought on by the Maillard Reaction, and slightly floral aroma in the bottom of the empty cup. This tea is from China and is rolled into pretty little orbs of green and white. The stems and buds, the white portion of the tea plant, are included. The harvested tea leaves are placed on a shirt lined with jasmine petals and rolled to infuse the jasmine perfume into the leaves. 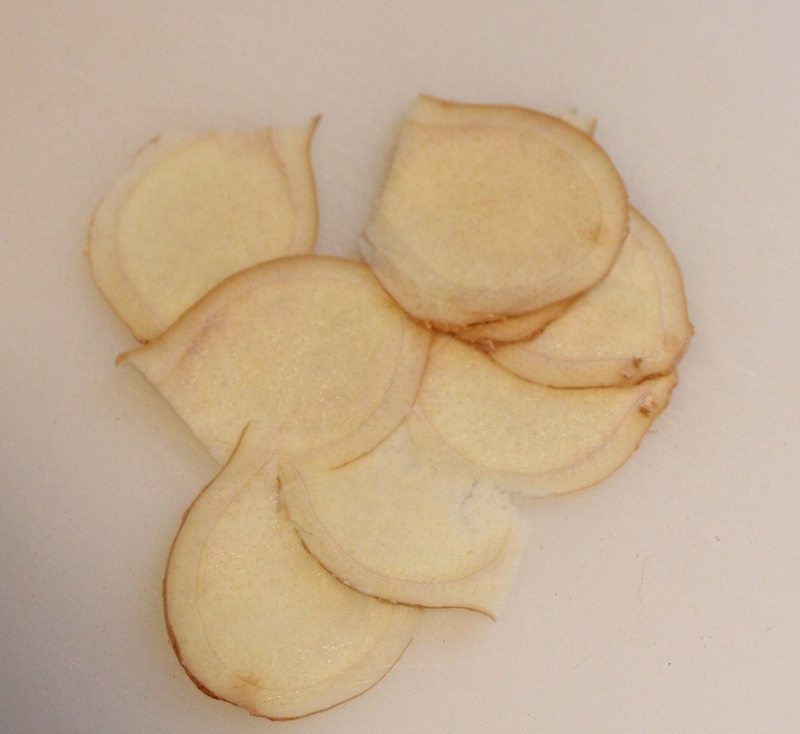 The jasmine petals are then removed; the remaining pollen contributes added flavor. Brew for three minutes. The first infusion is very fragrant and the jasmine taste is strong. With multiple infusions, the color of the water gets lighter but the jasmine flavor is still apparent. We had a lovely and informative two-hour tasting party. It was a pleasure to talk with Will about tea. He’s very passionate and knowledgeable about the topic. years I graduated to VO, VVO and then Crown Royal. If Crown Royal wasn’t available I’d settle for Jack Daniels. I never acquired a taste for scotch, though Jack Daniels is pretty close to that flavor profile, in my opinion. Several years ago I was introduced to Maker’s Mark by a friend and that was added to my thin repertoire of whiskeys. My daughter introduced me to the Dirty Vodka Martini. Unlike drinking whiskey neat or on the rocks, having a mixed cocktail can vary from bartender to bartender. I’ve learned to make my own: two ounces vodka, one and one-half ounces olive juice, shaken with ice and then poured neat into a glass with three olives. I always request three olives. There is nothing quite like a soused olive. I don’t care for gin, but if a friend has a martini made with gin and doesn’t eat the olives, I’ll take them. MMMM, soused olives! 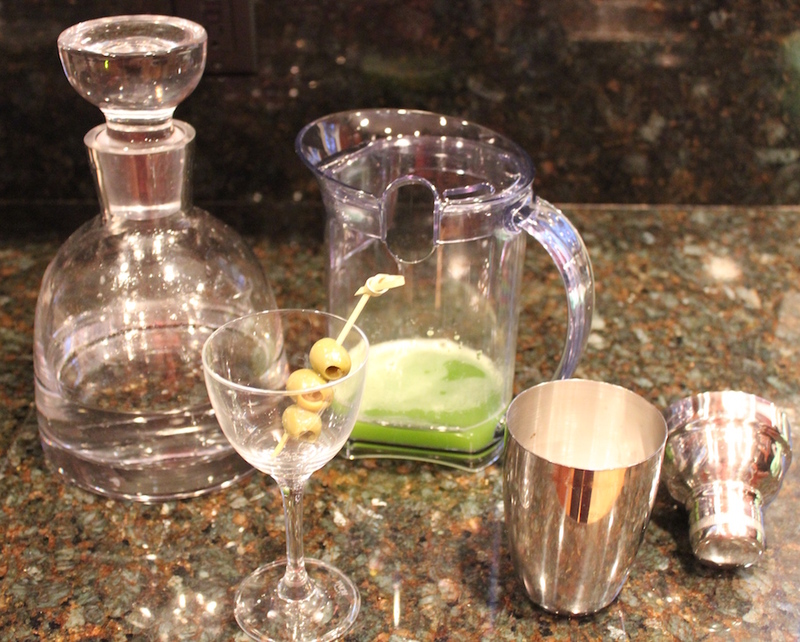 The Celery Martini seemed like a great idea – celery and olives are delicious together. 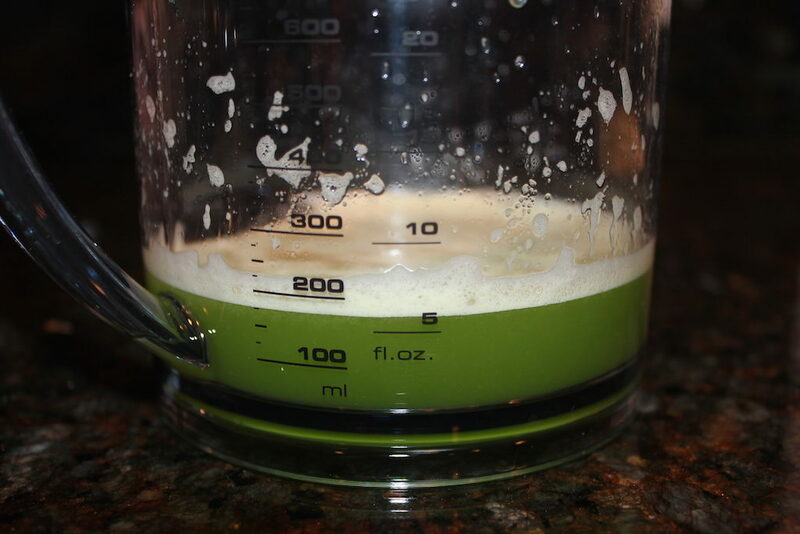 A juicer is the easiest way to get the celery juice. If you don’t have one, use a food processor and puree the celery to smithereens and then dump it into cheesecloth over a bowl, wrap it up tight and squeeze until dry. 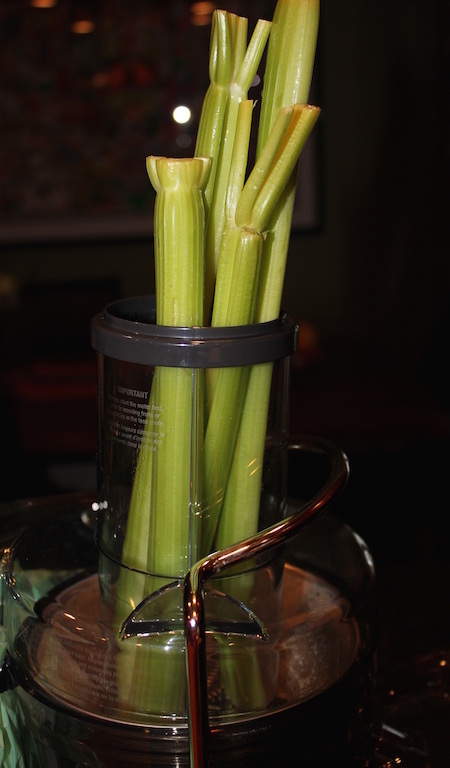 These four stalks made six ounces celery juice (in the juicer0; enough for three martinis. The vibrant green color is a bit startling, but the flavor is distinctly celery without any bitterness. Very clean and refreshing. I was tempted to add a little olive juice to the mix, but then realized that the speared olives would add a pleasing saltiness as needed. And isn’t that Nick and Nora martini glass just adorable!! A refreshing and pretty cocktail. Add the olives, plain or stuffed, for a bit of saltiness. Place four ice cubes in a martini shaker, add the vodka and celery juice. Shake and pour over the speared olives. 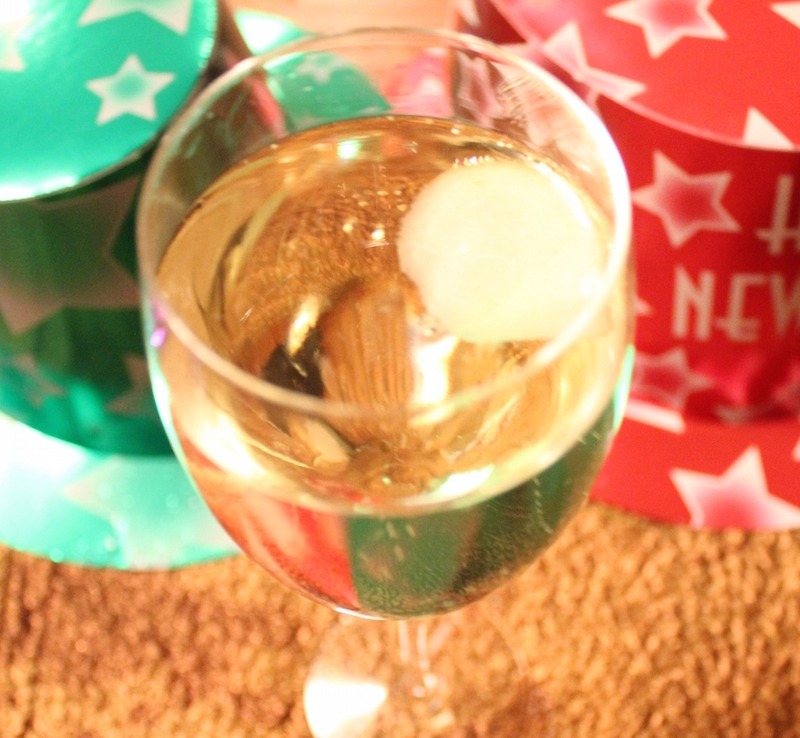 There is no better way to celebrate the incoming New Year than with a bubbly glass of sparkling wine. Well, there’s no better way to celebrate anything than with a flute of bubbly! This year we’ll be ringing in 2015 (WOW) with a little adaptation of mine on the traditional Bellini, a Gingersnap Bellini. 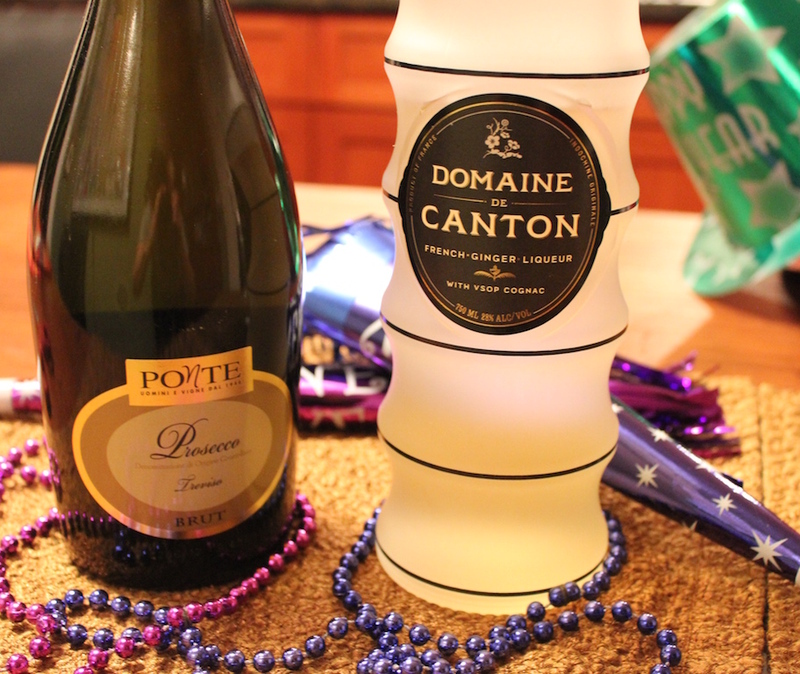 I found this wonderful ginger liqueur Domaine de Canton, which also contains VSOP cognac. Mix the liqueur with a brut Prosecco and a paper-thin slice of fresh ginger. Champagne flutes come in a range of sizes. I have two different flutes, a four ounce and an eight ounce. This recipe works best with the eight-ounce flute, just divide by two for the smaller glass, or make in a measuring cup and pour into two glasses and garnish each with the fresh ginger. Celebrating with a large group? No problem. A 750 ml bottle of Prosecco contains 25 fluid ounces. Use four bottles and 18 ounces ginger liqueur. 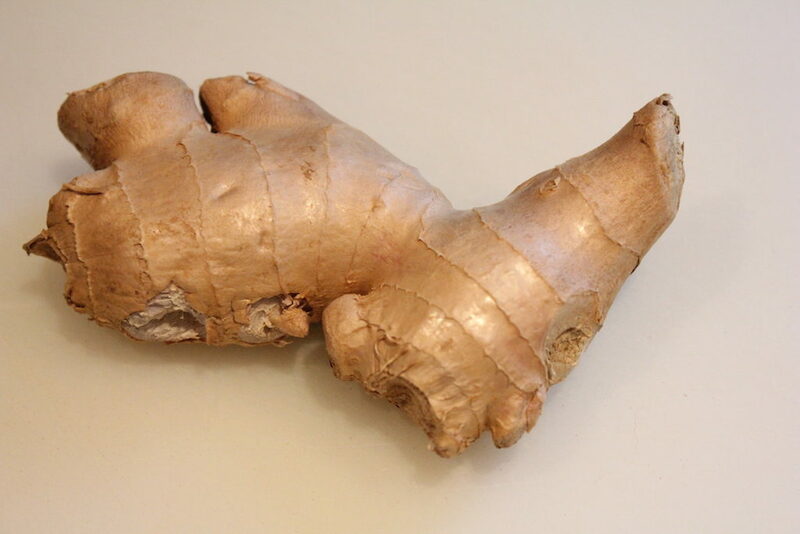 Pour into a punch bowl, toss in a bunch of sliced ginger. 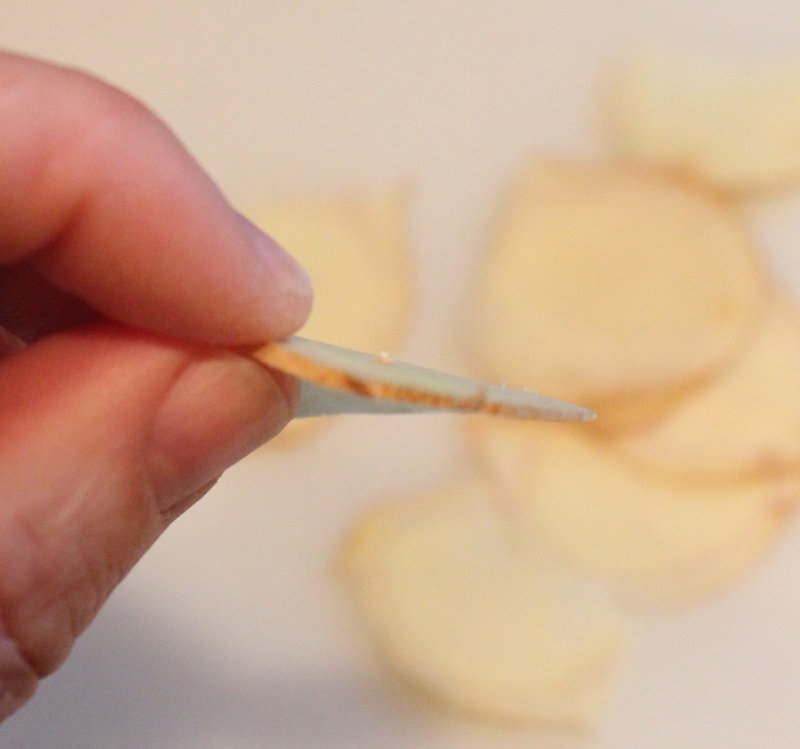 Keep extra ginger slices on the side for guests to put in their drink. 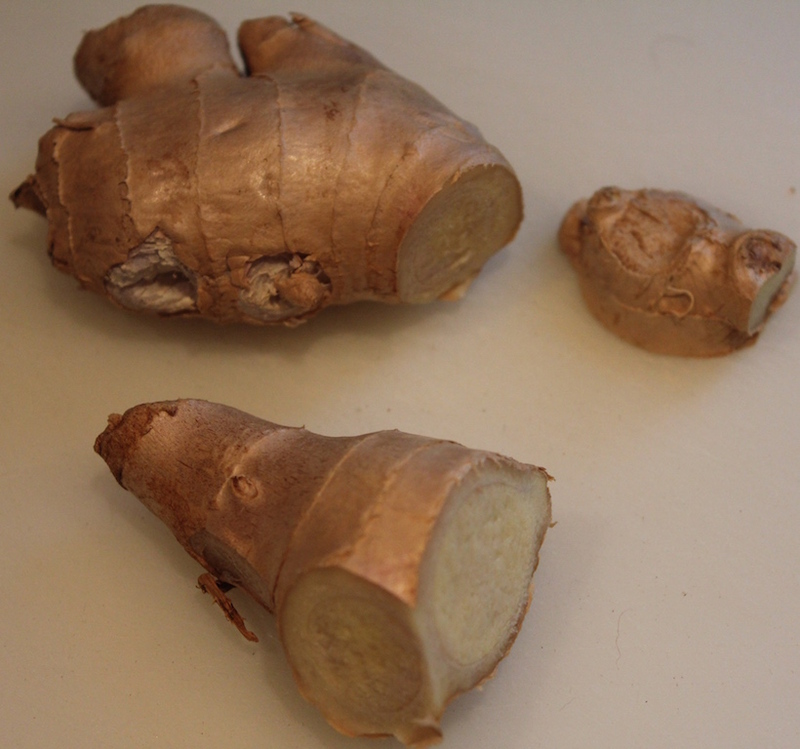 Select a firm, heavy ginger root, give it a good, but gentle scrub under cold water, and dry. Slice off an end and any knobby portions on the sides. 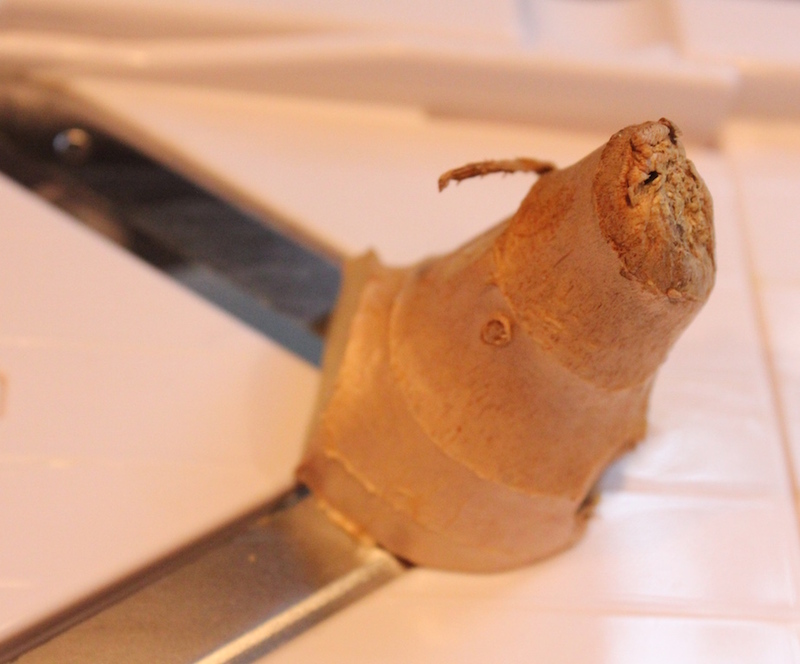 Use a food slicer on the thinnest setting or use a very sharp knife to cut paper-thin slices. Pour the liqueur into the bottom of a champagne flute, add the Prosecco and garnish with a fresh slice of ginger. Champagne flutes come in a range of sizes. I have two different flutes, a four ounce and an eight ounce. The recipe below is for the eight-ounce flute, just divide by two for the smaller glass, or make in a measuring cup and pour into two glasses and garnish each with the fresh ginger. Slowly pour the Prosecco and ginger into a punch bowl, stir gently and top with the ginger slices. This delicious and refreshing Strawberry-Limeade Vodka Martini is quick and easy to make. It starts with a batch of strawberry limeade, which can be served as a non-alcoholic drink. Great in the summer when strawberries are in season. Make up a large batch and set out to let people make there own – with vodka or not. A couple of tips for using carbonated water: pour the carbonated water into the pitcher first to minimize the amount of foam created when adding the juice and only combine the juice and carbonated water just before serving to keep it sparkling. Puree the strawberries in a blender with the water, sugar and lime juice. Let this sit for an hour to optimize flavor. Pour water or sparkling water into the pitcher and add the juice. Stir gently to combine. For the martini, use 2 ounces strawberry-lime juice, 1 1/2 ounces Vodka (I used Kettle One) and 3 ounces seltzer. Garnish the martini glass with a slice of lime and/or a small strawberry.